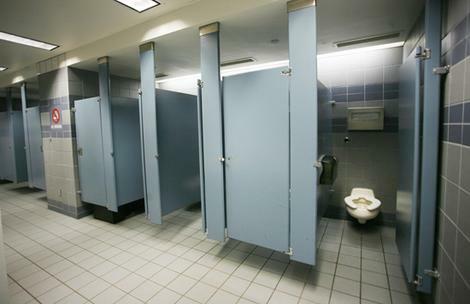 The Minneapolis Star-Tribune reports that two men’s restrooms at Minneapolis-St. Paul International Airport, including the one made famous as the scene of Senator Larry Craig’s alleged foot-tapping, will be remodeled. Specifically, the stalls are to be fitted with longer dividers to make, shall we say, "liaisons" more difficult. As you are likely aware, Craig was charged with disorderly conduct after an undercover officer said Craig had tapped his foot and waved his fingers under the divider in a way that the officer says signals a desire for liaisons. These sting operations were going on because liaisons had frequently been reported in these airport restroooms, and airport officials had discovered that liaisons there were being planned in advance over the Internet. Police had made about three dozen arrests there prior to the time that Senator Craig showed up. Airport officials say that the two restrooms scheduled for remodeling first are "among the busiest" — seems hard to argue with that — and that they have not yet decided whether the other 78 restrooms at the airport will be similarly refitted. Liaison-proofing all 80 restrooms would cost about $1 million, an amount that is apparently being spent despite the fact that, as the article put it, "complaints about sexual activity in the bathrooms have evaporated since Craig’s arrest and [since] people realized the bathrooms were under surveillance." But a spokesman appeared to be resigned to the likelihood that the conduct would recur somewhere else. "If everybody would behave themselves," he said, "we wouldn’t have to spend money on any of these modifications." It is unclear whether the modifications will stem the public interest in the stall in which Craig was arrested, which has apparently been drawing enough attention that they might as well add it to the Register of National Historic Places. "It’s become a tourist attraction," said one airport worker. "People are taking pictures." Jon and Sally Westby, a couple on their way to Guatemala, said they "just had to" stop and check out the site. "In fact," said Sally, "it’s Jon’s second time – he was here last week." "It’s the second stall from the right," Jon confirmed. If he laughed nervously, it was not recorded.